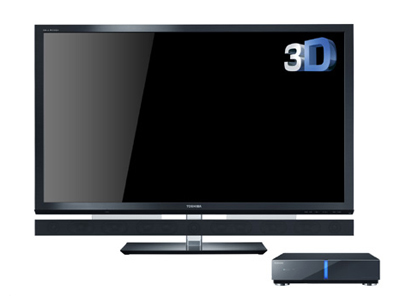 The 3D TV boom isn’t ending. As announced back in April, Toshiba Japan today showed [press release in English] a total of three new Cell Regza LCD TVs, and all of them are 3D enabled and full HD. These are the “CELL REGZA SLIM” 46XE2 (46 inches) and CELL REGZA SLIM 55XE3 (55 inches) plus another 55-inch model, the CELL Regza 55X2 (pictured). All models have the CELL processor on board and feature what Toshiba calls “Real Time 2D3D Conversion Technology”, meaning (you guessed it) users will be able to turn 2D images into 3D images instantaneously. They all are web-enabled (supporting video-on-demand, for instance), offer REGZA Link, support DLNA, and come with a so-called “Mega LED Panel” (240Hz), next to a 3TB HDD. The flagship 55X2 boasts a 9,000,000:1 contrast ratio and produces 1,000 cd/m2 brightness, while the other two “just” have a contrast ratio of 4,000,000:1. You won’t be surprised to hear that specs like these come with a price. Japanese buyers will have to pay $6,800 for the CELL REGZA SLIM 46XE2, $8,000 for the CELL REGZA SLIM 55XE3 and even $11,400 for the 55X2. Toshiba plans to release all models as early as next month but hasn’t said yet when or if it will bring these devices to other markets.